Cyclamen are a truly lovely group of tuberous plants! 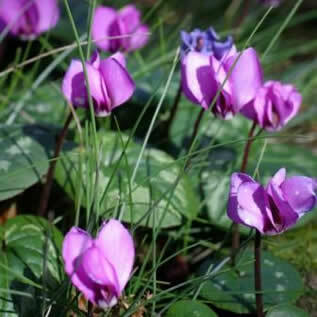 As E. A. Bowles once said: ” I know of no other plant that will turn patches of dust under thick trees into stretches of beauty so permanently and thoroughly.” And this time of the year it will be Cyclamen coum which provides colour in the darker corners of the garden. The dainty flowers with their upswept petals are produced at the same time as the foliage, which will be left as a pretty carpet once the blooms have finished. Since this is a very variable species, flowers can be white, shell-pink, rose or magenta, and the kidney-shaped foliage may be glossy dark green or beautifully patterned with silver. Cyclamen coum is one of the hardier species and one of the easiest to grow. It thrives in humus-rich soil under trees and will grow even in short grass. This species is a useful compliment to snowdrops, winter aconites and other early spring flowering bulbs and makes an excellent companion for ferns and other shade-loving plants.